Growing Strawberries in Containers is simple, and delicious! Have you thought about growing strawberries in containers? Almost everyone enjoys the taste of a fresh strawberry. But a bite into a strawberry from the grocery store can leave you disappointed. in containers a good choice? 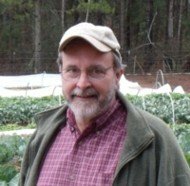 Commercial growers choose strawberry varieties for how well they produce, and how fresh they will stay during shipping, and not so much for their sweetness. Home grown strawberries are usually sweeter. Second, strawberries are usually on the top 12 list for produce most contaminated with pesticides. Growing your own is definitely a good option. Twenty five strawberry plants grow enough berries for the average sized family. Growing this many plants in containers is easy and fun. You can choose the traditional strawberry container with pockets around the sides of the pot, or hanging baskets, or even plain plastic pots. Use at least a 10” container. When you have a larger amount of soil, the soil will not dry out as quickly. This makes it easier to keep your plants watered. For growing strawberries in containers, I like a mixture of soil that is 2/3rds organic peat or perlite soil. For the other 1/3rd of soil, I like a good compost, or better yet, worm castings. This mix drains well but retains some moisture. 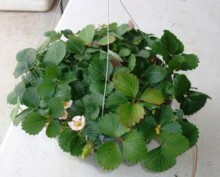 This is perfect for strawberry plants, as they don’t like to be dry for very long. I water my plants with enough water to saturate the soil, then I don't water again till the soil dries out slightly. It may take one, two days, or even more for the soil to dry slightly, depending on wind and temperature. A good way to check to see if your plants need water is to put you finger down in the soil and pull out a small bit between your finger and thumb, then squeeze. If you can squeeze out a drop of water, the plants are wet enough. If you cannot squeeze out any water then they need another watering. I feed my berry plants regularly to keep them in good health and to keep them producing berries. I like to fertilize with fish emulsion at least once a week. In the summer when the plants are producing berries, I usually fertilize twice a week. I use about an ounce of fish per gallon of water, then add in a teaspoon of Ocean Trace. 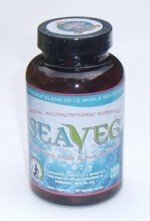 Ocean Trace is a low sodium sea mineral concentrate containing a nice blend of trace minerals. Providing my plants with good nutrition, especially trace minerals, is THE key to great tasting berries. It also helps the plant to naturally fight off insects and disease. Fish emulsion provides nitrogen, phosphorus, potassium and calcium, along with many other nutrients. Ocean Trace provides a concentrated source of valuable trace minerals that are easily absorbed by the plant. Added together, these two products make up a complete organic fertilizer. You can spray the diluted fish emulsion and Ocean Trace mix on the leaves, plus you can use it to water the soil. Although called June bearing, it actually depends on where you live as to the exact time when the June plants will produce their berries. The point is, they bear just once a year for about 3 to 4 weeks. 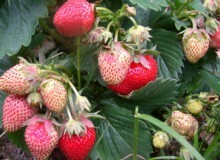 Ever-bearing strawberry plants bear a heavy crop in the spring or early summer (depending again on where you live). Then about every 6 weeks they bear a smaller crop. They continue this until cold weather sets in. For container growing I prefer the ever-bearing variety, since it allows me to enjoy my strawberries for a longer period of time. Ozark beauty. Some runners my not produce the first year. Fall or Early spring is a good time to plant your strawberries. Because strawberries are a perennial, you can enjoy them for several years. 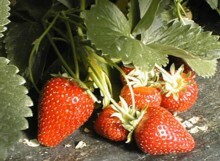 Each year replace the original strawberry plants with runners from the mother plant. If you live in the South, do this in the fall. If you live in a climate with severe winters, do it in the very early spring. Here is how you do it. This will rejuvenate your container and give you more strawberries. Depending on where you live, this my be as simple as covering them with a frost blanket. In cold climates, you can move them in to a protected area like a garage during sub freezing weather. Some varieties are more cold hardy than others. However, having your plants in a pot above ground makes them more vulnerable to the cold of winter and the heat of summer. Strawberries need lots of sun, at least 6 to 8 hours a day. Its a good idea to rotate the container occasionally so that it gets sun on all sides. For those days when the temperature reaches into the 90’s, you may need to place your plants where they will get morning and evening sun, but are shaded slightly from the hot afternoon sun. Strawberries are fun to grow, and they are so good for you. They are packed with vitamin C, minerals and antioxidants. I encourage you to try growing strawberries in containers just for the fun and flavor of it. Who knows, you might even find yourself feeling better.